Let the Pokémon TCG: Dragon Majesty Pin Collections help take you higher with Pokémon of supersonic speed and bold moves! 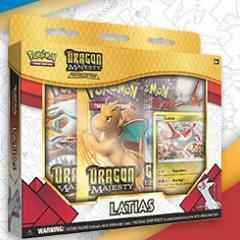 This set is the first to include booster packs from the special Dragon Majesty expansion, and they'll help you build your collection with the extreme speed and Dragon-type power of the Eon Pokémon Latias. Look for a special pin and a foil promo card featuring the Legendary Pokémon in each collection. It's a perfect plan for any great Pokémon Trainer to fly straight to the top!